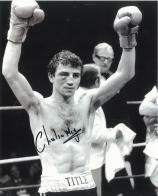 Charlie Magri (born 20 July 1956 in Tunis, Tunisia) is a former English flyweight boxer. He is from a Maltese family that settled in Stepney, London where he grew up. During his professional career he held the WBC, European, and British flyweight titles.